... 7.1. Integer or Int? We’ve seen putStrLn. It lets us output any String on the screen. What if we want to print out a number instead of a String? We have the following definition for an expression that is adding two numbers, and we want to print the resulting value out in a program. So, we know that the putStrLn :: String -> IO () function takes a String, and leaves us with an IO () value. We don’t have a String, though, we have an Integer value. How can we match these up so we can print out our number on the screen? Ok, breathe. Let’s first look at the right side: a -> a -> a. Why all the a’s? Well, we know from all the (->)’s that this means it’s a function that takes two values of type “a”, and returns a third “a”. What is “a”, though? It’s what’s called a type variable. That means it can be any type. If it starts with a lowercase letter, it’s a type variable. If it starts with a capital, it’s an actual type, or a typeclass, which we'll explain soon (Num is a typeclass in Num a => a). If we don't specify the type of our numbers, Haskell's type inference works it out for us, which saves a lot of time and hassle. Now we have to think about the “Num a =>” part. That can be read as “a is constrained to types which are instances of the Num typeclass”. This mouthful means that the (+) function can take two arguments of any type at all (here we’re naming them a), as long as that type (again, here called a) is an instance of a typeclass called Num. Luckily for us, all numbers are! Here we’re using fromIntegral to build an “unspecialised” Num a => a version of the Int value of intFive so we can subsequently add it to floatTenPointThree. The value 5 :: Int is not of type Float, so the types won’t match unless we do this. However, if either of the values are of type Num a => a, then (+) will typecheck because it can match both types together (by concretizing the Num a => a type to Float). The Float, Int, and Integer types are all instances of the Num typeclass. There are many numeric types in Haskell such as these. To be able to do arithmetic functions on different numeric typed values, they are tagged as Num which allows us to define each of the simple arithmetic functions for each type differently, but use them all with the same name and interchange values. This “tagging” is called making a type an instance of a typeclass. When a programmer does this, they provide a definition against the particular type, for the functions that the typeclass requires. So we can see that (+) can add a Float or an Integer to a Num a => a without a problem. 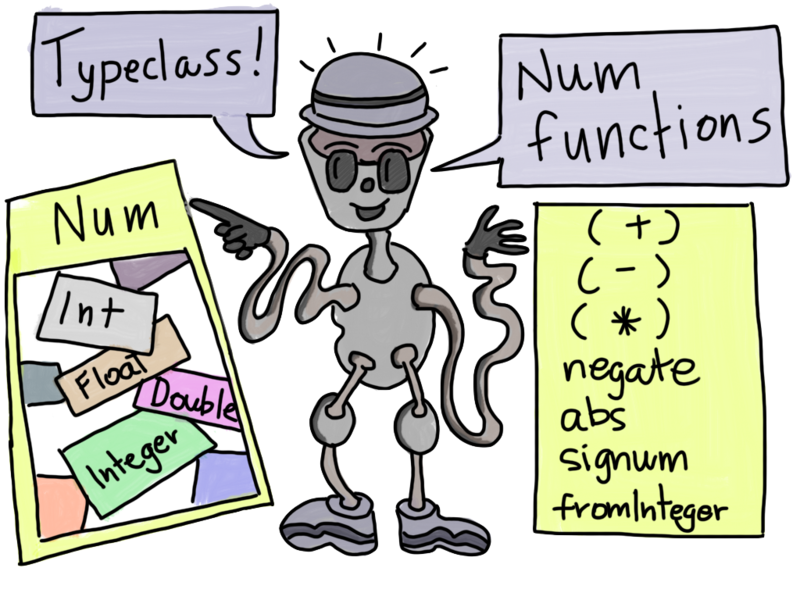 The Num typeclass is, in this way, like a kind of contract that programmers of a type can decide to kind of "subscribe to" which gives them the ability to write implementations of the functions that the Num typeclass provides. In turn, the typeclass system gives that type the ability to work with all the other types that are instances of that typeclass. So the Num typeclass means there actually isn’t only one definition for the functions for addition: (+), subtraction: (-), multiplication: (*), negation: negate, etc but rather that each type — that is, each instance of Num — has its own definition for each of these functions. What does all of this have to do with printing our number on the screen? Remeber, that problem we started the chapter with? We see that show is a function which takes a single argument of any type (the “a” type variable above) constrained to the Show typeclass, and returns a String. That single argument is anything that has an instance of Show defined for it. We know this because of the Show a => constraint. Parentheses are needed on show number because putStrLn only takes one argument, and the function application precedence rules mean that taking them off would give it two. Precedence is a fancy-pants word that simply means “which things come before or after which other things”. If we left off the parentheses, we would have this: putStrLn show number, which Haskell would see as “apply putStrLn to the value show, and then apply that to the value number”. However, putStrLn takes only String values, and show is a function, so that would definitely be a type error. See if you can work out what the following program does. Hint: don’t get caught up by the types of the values. This will probably be confusing, and should confuse you at least a little bit. We’ll explain what’s going on later, however, the important thing is just see if you can work out what the program will do when you run it.